Soil: Moist, sandy soils are fine. Bloom Time and Color: Bright yellow blooms in late spring or early summer. 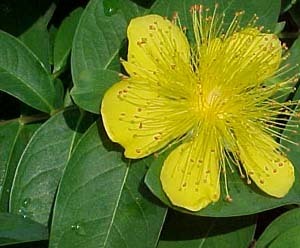 Description: St. John's Wort is a perennial herb that grows into a small shrub if allowed. With attractive leaves, it has clusters of bright yellow flowers that bloom from July through August. It is easy to grow and used primarily for medicinal purposes. St. John's Wort is believed to have been named after St. John the Baptist. This plant spreads quickly. Almost any area of your garden or flower bed will be acceptable to plant St. John's Wort. Care: Not much care is needed.